Money is the ideal last minute birthday gift. All you need to do is open your wallet or stop by the nearest ATM machine, take out some bills and put them in a nice envelope. With a little creativity and 10-20 minutes you can easily turn it to the perfect last minute gift! Hang one money balloon for each year of the recipient's life - you can start a family tradition like Amy from increasingly domestic. 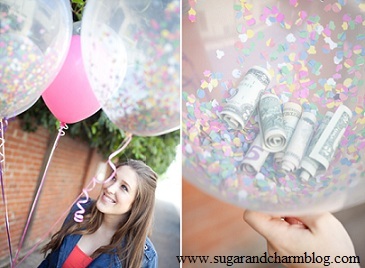 Another excellent option is to give helium balloons filled with confetti and money. Here are some tips from Eden from Sugar and Charm who was kind enough to share her photos with us too – Thank you Eden! I think this is the funniest way to give money. Get an empty tissue box and lots of 1 dollar bills. Tape the bills together end to end using a scotch tape and roll them up. Put the roll in the empty tissue box and tape a tissue to the end of the money roll so it is hung out of the box and wrap the box. Thanks for Lovezilla for the funny idea and for the lovely photo. With this last minute birthday gift you can really wait for the last minute. All you'll need is one quality chocolate bar and a bill of your choice. Gently remove the outer wrapping, place the bill between the silver/gold wrapping and the outer wrapping and glue it back. Put it in a nice gift bag and you're done! 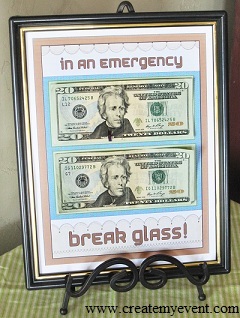 This is a great last minute gift idea that is very easy to make and so much fun to receive. All you need is 1-2 bills and a photo frame. Thanks for Elaine from Create My Event for the photo! If you're looking for a prank gift – this is a great choice! 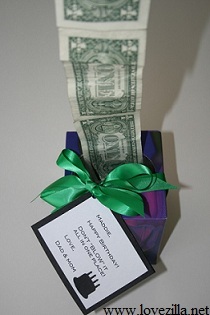 Get your recipient's favorite box of cigarettes, open it, replace the cigarettes with rolled up dollar bills (or 5$, 10$, 20$ or a mix of them) and re-wrap it with cellophane paper. Now that the flowers are ready - use floral wires or pipe cleaners to hang them on the tree. That's it - your money tree gift is ready! Gently open the chocolate box and use double sided tape to secure the folded bills under each bonbon. Then use cellophane paper or a shrink wrap to re-wrap it. Money is considered as a dirty thing so make sure each bonbon is wrapped individually. You can, of course, put cash instead of the chocolates. I know that not everyone thinks that money makes a good gift but it sure is a great last minute birthday gift (and graduation and holiday and retirement and whatever occasion…). I hope that these ideas showed you that you can easily "wrap" it in many creative ways and personalized it a bit.